This chutney is a perfect accompaniment for dosa and idly. 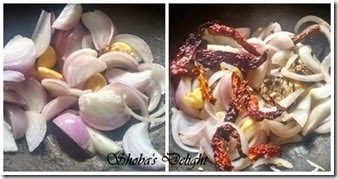 The sweetness of the onions is balanced by the sourness from the tamarind and spice from the red chillies. This recipe is a perfect balance of flavors. I learnt this recipe from Amma and now it’s my fav too. If you use a little bit more oil than mentioned in the recipe, this chutney will keep very well 2-3 days and thus is ideal for travel. It is used for variety of curries, rice dishes, breads, scrambled eggs. 1. Heat 1 tsp oil in a pan on low heat and sauté the whole dry red chillies. In the same pan, add 2 tsp of oil and add roughly chopped onions and some salt. Cook until the onions are tender and light brown in color. Cool for some time. 2. Heat some oil in the pan add do the mustard seeds, let them splutter and then add the asafetida and curry leaves for tempering. Add in the onion paste and mix well to combine. Adjust salt and cook for a minute. 3. Cool and store in an airtight container in the refrigerator. Heat before serving. Also can be Served with normal dosa, butterbean soy dosa,carrot dosa, oats idli or even with steamed rice. You might be wondering when the onion chutney looks like tomato chutney.I have added byadiga red chillies instead of the normal red chillies. My friend was using grated ginger along with onions.But I did not like that taste.It totally changes the flavor and the taste of chutneys. Actually my son does not like when the chutney is coarsely ground.So I ground it smoothly. 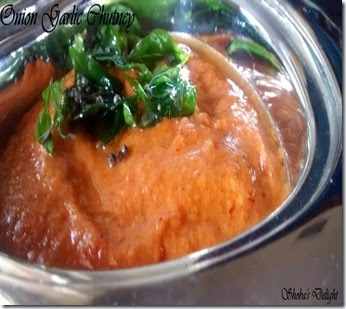 Technorati Tags: Chutney recipes,Onion recipes,onion chutney recipes,garlic recipes,Onion garlic recipes,Simple south indian chutney recipes,Indian food recipes,Vegetarian recipes. 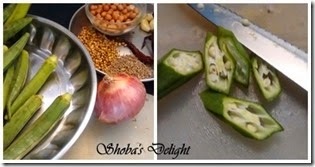 Okra or Lady’s finger fry generally needs lots of oil to get good taste. 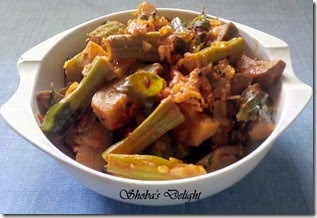 But this Okra masala fry needs very little oil for frying and it definitely gives a very different and wonderful taste. Coriander seeds – 2 tsp. 1. Wash and wipe lady's finger well with a clean kitchen towel. This helps to prevent the lady's finger from getting sticky while cooking. 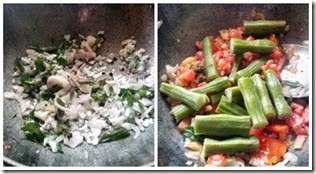 Discard the head and the tail and slit the okra (lady’s finger) diagonally. 2. Heat oil in a non- stick pan. Add onions and sauté for 2 mins and fry till they turn pink. 3. 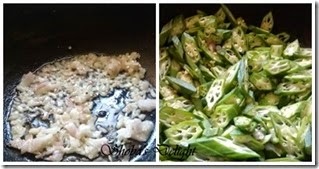 Then add the okra and fry till they are partially soft. 4. In the meantime, dry roast the cumin seeds and coriander seeds in a separate pan.Add dry red chillies to the roasting spices.Continue to roast till fragnant. 5. 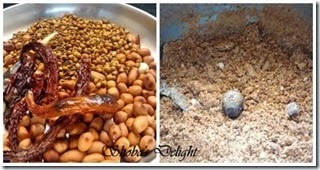 Cool it for few minutes.In a blender jar,add roasted peanuts, garlic,dry roasted items.Just grind it coarsely. 6. 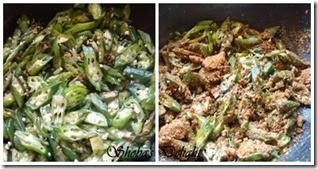 Then add the ground paste to the okra along with required amount of salt.Fry till the okra is fully cooked. 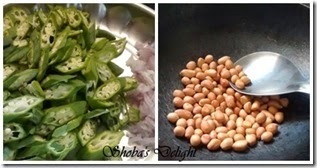 Serve hot with simple dal tadka or with Kala channa rasam.A tasty bindi masala can be served with roti also. 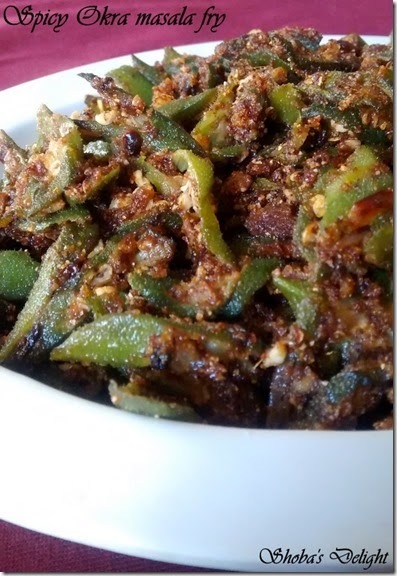 Technorati Tags: Bhini masala fry recipes,Okra recipes,Vendakkai recipes,Andhra recipes,Simple side dish recipes. 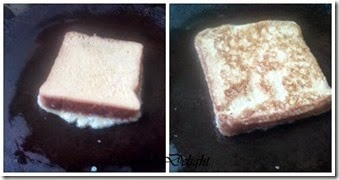 French toast is easy, delicious and satisfying breakfast recipe for the family. Sliced bread soaked in an egg mixture and fried. French toast is a great way to get your kids to eat eggs without them knowing. · Sugar - 4 tbsp. · Milk - 2 tbsp. 1. 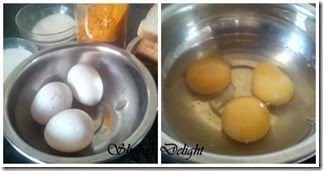 In a large bowl, whisk egg .Now take hot milk with sugar, turmeric powder. 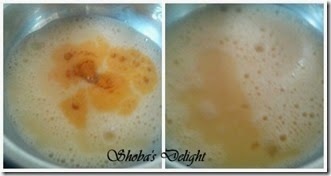 Stir it till sugar dissolves.Combine the milk mixture along with the whisked egg. Now add vanilla extract and cinnamon powder. 2. Preheat a non-stick fry pan to medium-high heat. Leave it to rest and soak for a few minutes while you warm a frying pan over a low heat with the oil. 3. Dip each slice of bread in the egg wash until coated on both sides and put straight into the fry pan.Cook for 2-3 minutes each side until golden and separates easily from the fry pan. 4. If the bread is sticking to the pan, cook a bit longer. Serve plain, buttered, or with your child's favorite spread or cheese. French toast is a delicious way to get fussy eaters to eat eggs.To maximize egg intake, reduce the milk to a teaspoon or two. If you do this, there may only be enough egg wash to coat two slices of bread. 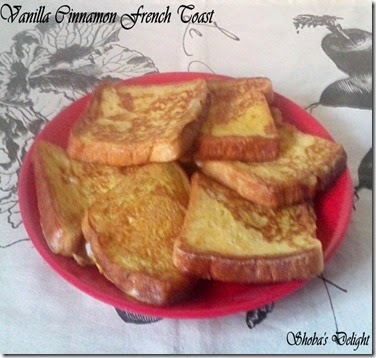 Technorati Tags: French toast recipes,Egg recipes,breakfast recipes,Kids Delight,Vanilla Recipes,Cinnamon recipes,Vanilla cinnamon french toast recipes. 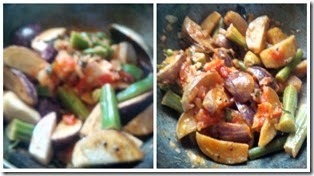 The soft eggplant along with the drumstick makes for a great combination. The masala was very tasty with curd rice. A simple side dish which goes well with mild curry like any sambar, sodhi.Drumsticks are thin and slender stick shaped -hard outside and fleshy inside. They are rich in calcium and phosphorus.The flowers too are cooked and in some places the roots as well. Adding sambar powder to the spice mix really brings out the flavors. 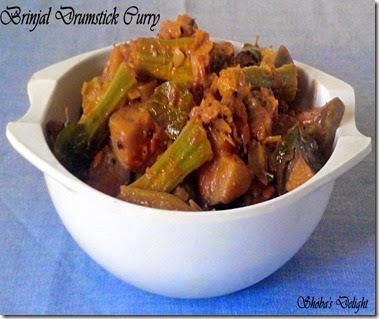 A matching combo of brinjal and drumstick usually adds a little kick to your daily meal. · Ginger garlic paste – 1 tbsp. 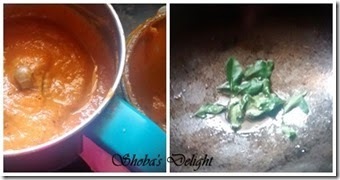 · Sāmbhar powder -1 tbsp. 1. Chop onion, tomato and keep other ingredients ready. 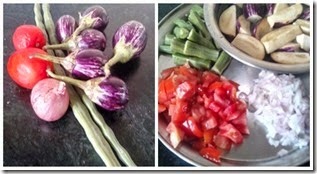 Cut drumstick and brinjal to finger size pieces. 2. 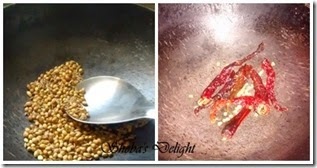 Heat oil in a pan/kadai, splutter mustard seeds, split urad dal, curry leaves, asafetida. Add onion and fry until brown. Add ginger garlic paste and fry until raw smell goes off. Add tomato and fry until it turns mushy. 3. Add sambar powder, red chili powder, coriander powder and turmeric powder. Fry for couple of mins and then add drumstick and brinjal. Add 1/2 cup water, cover the vessel and simmer it off till the oil separates.Add salt and mix well. Close pan and cook until veggies are done and oil separates from poriyal. 4. 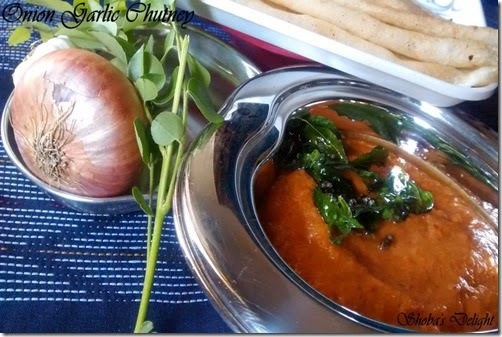 Once the drumstick and brinjal cook, simmer for few minutes till the gravy turns to dry, then remove from heat.Brinjal-Drumstick poriyal is ready to be served.Serve this poriyal with rice and rasam. Brinjals must always be soaked in water. Little curd or salt or lemon juice can be added to the water so that it won’t turns brown or black. Add some tamarind pulp (if using readymade, 1 tbsp. will do) and coconut powder to this curry which makes this masala sweeter as well as lil bit tangy. 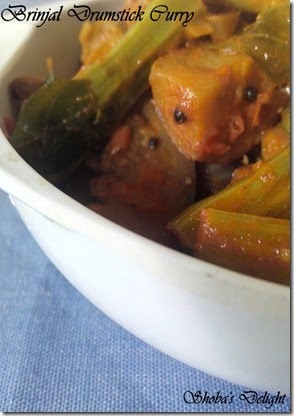 Technorati Tags: Brinjal recipes,Drumstick recipes,Curry varieties,Poriyal varieties,Brinjal varieties,Drumstick varieties,South indian recipes,Indian food recipes. Ragi (Finger millet) Vermicelli has lots of nutritional value.It is very handy and heart filling breakfast for a busy morning.I make 2 versions of it.The spicy one and a sweeter version.My kids love the sweeter version of mixing sugar and grated coconut to it.It is a nutritious breakfast. 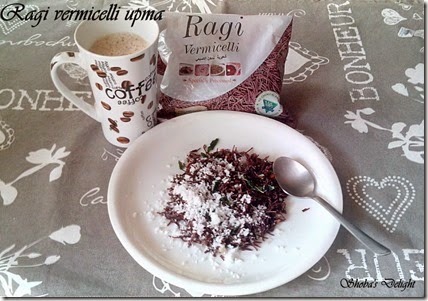 Now a days readymade ragi Vermicelli’s are available at all shops. Earlier my mom used to mix ragi flour with wheat flour and make Ragi Idiyappams out of it.You can either try making the sevais at home or make use of the readymade ragi Vermicelli’s.The recipe that I had mentioned here is the one that was printed at the back of this ragi vermicelli packet. · Grated coconut -3 tbsp. · Bengal gram -1 tbsp. 1. In a bowl take some amount of water. 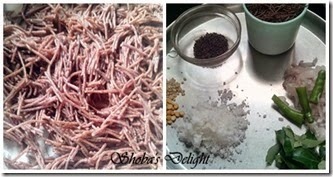 Add required quantity of salt to it.Add ragi vermicelli to the water. Soak it for a minute.Don't soak it for more than that or else the vermicelli will become very sticky. 2. 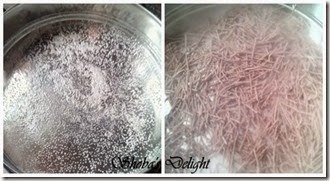 Filter the water through colander and keep the ragi vermicelli aside.Steam cook it for 5 minutes. Let it gets cool down for a minute. 3. Heat oil in a pan and add green chillies, onions.Saute till it gets transparent.Now add steamed vermicelli and if necessary add salt.Finally add grated coconut and mix it well. Another variation in this upma is adding lemon juice finally to get tangy taste,but I have added grated coconut finally to get some sweet taste. Technorati Tags: Ragi recipes,Vermicelli recipes,Sevai recipes,Upma recipes,Ragi vermecilli upma recipes.South Indian recipes,Indian Food recipes.